Green Ribbon End Mental Health Stigma Tullamore GreenRibbonIRL and #TullamoreGoesGreen. Tullamore is going green to end mental health stigma as part of See Change’s 6th National Green Ribbon campaign. For the month of May, See Change Ambassador James O’ Connor in conjunction with Tullamore & District Chamber of Commerce wants Tullamore to play its part in ending the stigma surrounding Mental Health issues and asks that the people of Tullamore come together to help make this happen. Chamber President Anne Starling along with James O'Connor and fellow members John Cusack and John Mollin will distribute over 7,000 free Green Ribbons to local businesses over the coming days and are asking that the business community comes together to support the campaign by asking their staff to wear a Green Ribbon for the month of May and to post a picture on Social Media using the hashtags #GreenRibbonIRL and #TullamoreGoesGreen. Research released by See Change ahead of the campaign shows that 1 in 5 people still associate derogatory language with mental health difficulties. “One of the most important ways in which we can reduce stigma is to change how we talk about mental health”, says John Saunders, Director of See Change. He continues, “Stigma often prevents people seeking help and speaking out. After last year’s campaign, 3 in 4 people said they were open to discussing mental health. We hope to improve upon this”. 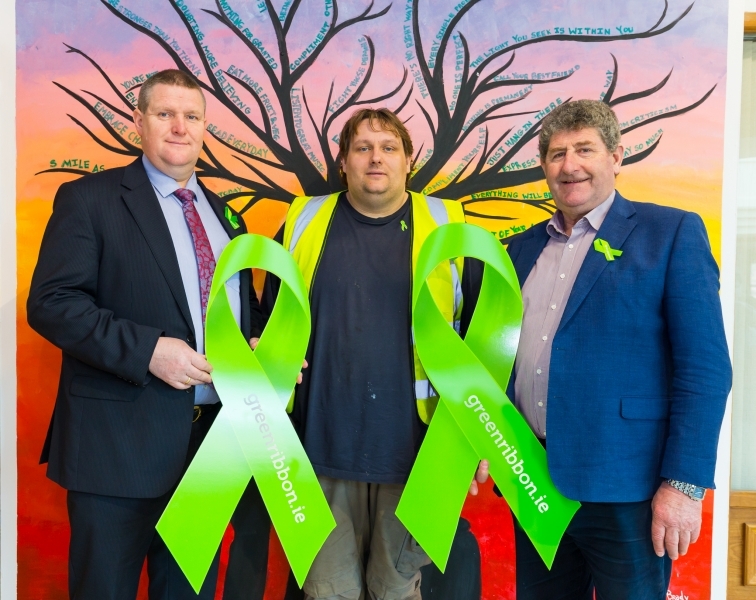 The Green Ribbon campaign aims to end mental health stigma by prompting hundreds of events and thousands of conversations all over Ireland during the month of May each year. The campaign will launch on Thursday 3rd May at 11am in the Mansion House, Dublin. Between now and the end of May 500,000 ribbons will be distributed to homes, workplaces, schools, colleges and communities all over Ireland to encourage people to talk about mental health. Green Ribbons will be available for free in many local businesses and we encourage members of the public to pick one up and post a picture on Social Media using the hashtags #GreenRibbonIRL and #TullamoreGoesGreen. See Change is a national partnership working to end mental health stigma in Ireland. The partnership is made up of over 100 organisations and 60 ambassadors who work to create a disruptive, community driven social movement to reduce the stigma and discrimination associated with mental health problems.